Estate Planning for Clients Married to Non-US Citizens | The Levin Law Firm - Philip Levin, Esq. In our increasingly globalized world, many American citizens have non-U.S. citizen spouses. 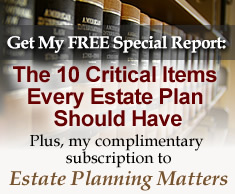 This can present a serious problem when such couples consider estate planning. Under Internal Revenue Code Section 2056(d) the unlimited estate tax marital deduction is not available to non-citizen spouses of a deceased U.S. citizen. As a result, such couples may have significantly greater transfer tax exposure for Federal estate tax purposes. Under current law, an individual can give away up to $5,490,000 during life or at death, which is known as the “Applicable Exclusion Amount”. However, amounts transferred in excess are taxed at a flat rate of 40%. Federal law also provides for unlimited gifts between spouses, so long as the transfer is made to a U.S. citizen spouse, which is commonly known as the “marital deduction.” As a result, married couples who are citizens can transfer unlimited amounts of property to each other during their lives or at death without affecting or exhausting their $5,490,000 Applicable Exclusion Amount. However, the unlimited marital deductions does not apply to couples where one spouse is a non-U.S. citizen. Normally, non-citizen spouses must pay estate tax on any amount transferred in excess of the Applicable Exclusion Amount. Similarly restrictive limits also apply to lifetime giving to non-U.S. citizen spouses. However, a Qualified Domestic Trust (“QDOT”), drafted in accordance with the legal requirement under Internal Revenue Code Section 2056A, does provide a partial solution to this tax issue facing many clients who are married to a non-U.S. citizen spouse. More specifically, so long as the U.S. citizen spouse leaves their assets upon death to a qualifying QDOT trust, the Federal estate tax on those assets funding the QDOT is delayed. If you are interested in learning more about estate planning strategies for individuals married to a non-U.S. citizen spouse, or would like to arrange a consultation with estate planning attorney Philip Levin, Esquire to discuss estate planning matters, please call The Levin Law Firm at (610) 977-2443.